Jeff Speck has dedicated his career to determining what makes cities thrive. And he has boiled it down to one key factor: walkability. The very idea of a modern metropolis evokes visions of bustling sidewalks, vital mass transit, and a vibrant, pedestrian-friendly urban core. But in the typical American city, the car is still king, and downtown is a place that’s easy to drive to but often not worth arriving at. 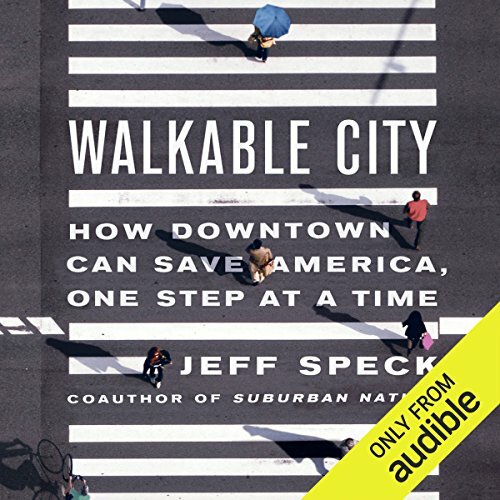 ©2012 Jeff Speck (P)2013 Audible, Inc. I enjoyed this book and found the information very interesting. However, many points made by the author, though possible or probable, were defended passionately yet sometimes lacking unmistakable evidence. Many arguments had several variables that could not strongly defend its theories. That said, I believe a handful of the theories were valid and at least should be considered for city planners. Between SUBURBAN NATION and this book, your eyes will be opened and then you'll find yourself thinking, "of course, it makes sense!" 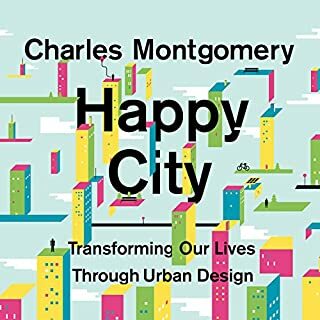 how we can reimagine our urban and suburban landscapes to be more pleasing, reduce crime, lower stress, reduce obesity, increase interactions and community, and help local business. What did you like best about Walkable City? What did you like least? There is a lot of good information about how to make cities more walkable. 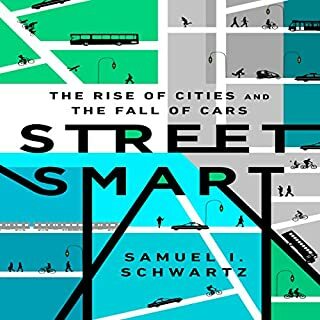 The recommendations are more than can be done by a given city in most cases, and the author explains this well in the final chapter of the book. What three words best describe Jeff Speck’s performance? I learned about this book via a Jeff Speck talk on TED. He is a much, much better live speaker than a book reader. I was disappointed in his reading, compared to what I saw in his TED talks. Super interesting book - this one will make you think about the world around you. Every city planner should have to read this. Great ideas, observations and strategies for creating vibrant cities. So many simple ideas that should be common sense to city planners but obviously aren't. 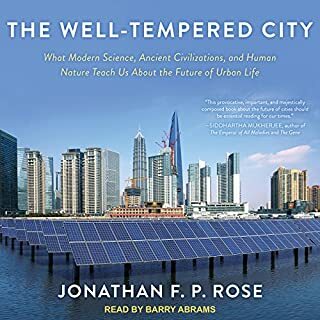 This was a great book about how we can make cities more livable. Speck emphasizes the way that zoning, land use, and transit all have to work together to be successful. 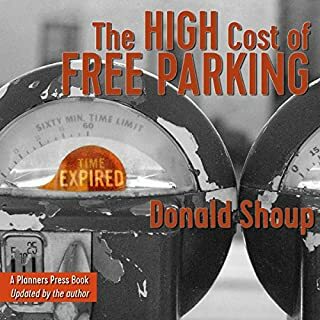 And the book is filled with wry criticisms of traffic engineers who have emphasized the value of traffic flow (and free parking) over all else. It‘s read by the author, but he does a terrific job. Very engaging. Outstanding treatise on what's gone wrong with site planning in America, why it matters, and what "steps" must be taken to return to center. 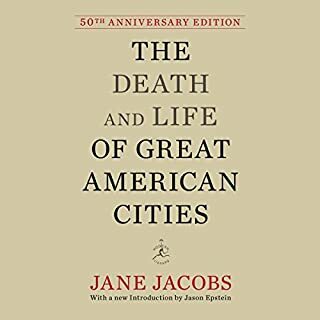 Chock full of critical statistics, specific analogs, and meaningful analysis, it should be a desk reference for all planners, local politicians, and any person who cares about a future America securely focused on great places and communities. Interesting topic and thoughtful insight, subpar recording. I liked this book a lot. The topics discussed were laid out neatly and organized and discussed well. Speck offers ten points for fixing American cities and then goes into more detail for each point. The ideas presented were easy to follow along with and offered insight to the design flaws that plague many American cities. However, throughout this recording you could occasionally hear Speck turn his pages, often you would hear a different recording that was used for correcting previous recordings (different volume and intonation). I understand corrections need to be made, but I have never listened to an audiobook with more corrected audio than this one. The content of the book is great. He's just not as talented as a professional narrator. Many books on Urban Planning are used to teach me something new, or to affirm many of my preconceptions. 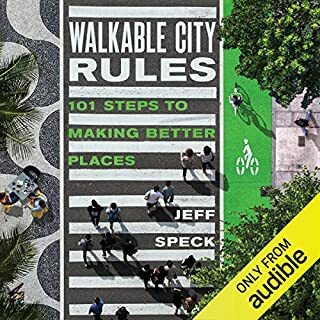 In Walkable City, however, the author had numerous points that challenged these preconceptions, and led me to reconsider positions I had taken for granted. An excellent examination in depth of walkability. The author, while good in humor and engaging, could stand to practice his vocal delivery, as there were a number of instances where I had difficulty understanding him. His voice is deep, and at times mumbles the ending of sentences. Overall, great work I recommend to any urban enthusiast.